te, ovate or oblong elliptic with rounded apex, with 3 depressed longitudinal veins at the base. The leaves are about 2.5 to 3.2 cm long and 1.8 to 3.8 cm wide having fine tooth at margin. It is dark-green and glossy on the upper side and pubescent and pale-green to grey-green on the lower side. Depending on the climate, the foliage of the Z. mauritiana may be evergreen or deciduous. The flowers are tiny, yellow, 5-petalled and are usually in twos and threes in the leaf axils. Flowers are white or greenish white and the fruits are orange to brown, 2–3 cm long, with edible white pulp surrounding a 2-locular pyrene. This quick growing tree starts producing fruits within three years. The fruit is a soft, juicy, drupe that is 2.5 cm diameter though with sophisticated cultivation the fruit has of size 6.25 cm long and 4.5 cm wide. The form may be oval, obovate, round or oblong; the skin smooth or rough, glossy, thin but tough. The fruit ripen at different times even on a single tree. Fruits are first green, turning yellow as they ripen. The fully mature fruit is entirely red, soft, juicy with wrinkled skin and has pleasant aroma. The ripe fruit is sweet and sour in taste. 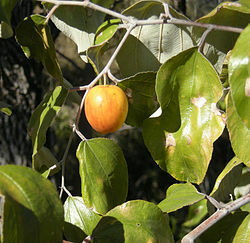 Both flesh texture and taste are reminiscent of apples. When under ripe the flesh is white and crispy, acid to subacid to sweet in taste. Fully ripe fruits are less crisp and somewhat mealy; overripe fruits are wrinkled, the flesh buff-coloured, soft, spongy and musky. At first the aroma is apple like and pleasant but it becomes peculiarly musky when overripe. There is a single, hard, oval or oblate, rough central stone which contains 2 elliptic, brown seeds, 1/4 in (6mm) long.